Thorium (Th) and protactinium (Pa) are very efficient tracers of particle dynamics in the ocean. More particularly, their relative distributions inform on the intensity of "scavenging", in other words, the processes that remove dissolved elements from seawater by their precipitation or adsorption on particles. 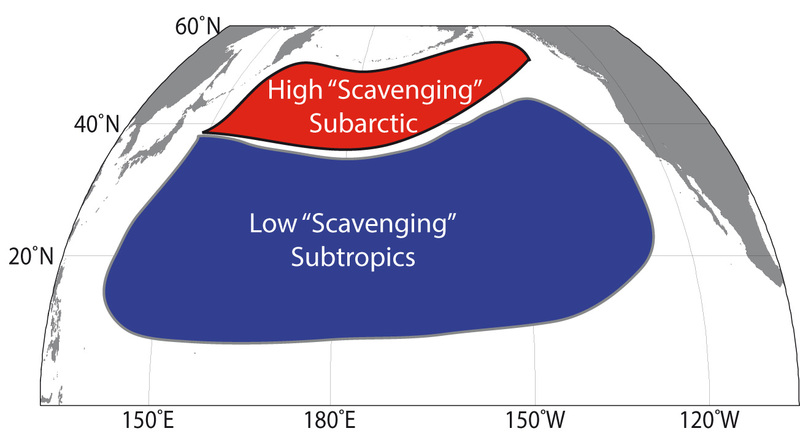 Thanks to 12 new profiles in the North Pacific, Hayes and co-authors observe a much larger relative difference in scavenging intensity between the Subtropical gyre and Subarctic Pacific gyre than within each of these regions. This effect is greater for Pa than for Th, likely reflecting the fact that biogenic silica, a phase produced by diatoms which has a strong affinity for Pa, is much more prevalent in the North. While highlighting the role of biogeography, the study also finds that in the deep ocean, manganese oxides, an inorganic phase, may play an additional role in Pa scavenging. Figure: Simplified figure showing scavenging intensity in the Pacific Ocean. Please click here to view the figure larger. Hayes, C. T., Anderson, R. F., Jaccard, S. L., François, R., Fleisher, M. Q., Soon, M., & Gersonde, R. (2013). A new perspective on boundary scavenging in the North Pacific Ocean. Earth and Planetary Science Letters, 369-370, 86–97. doi:10.1016/j.epsl.2013.03.008. Click here to access the paper. To get a username and password, please contact the GEOTRACES IPO. Copyright © 2010 GEOTRACES. All Rights Reserved. This web site is hosted by OBSERVATOIRE OCEANOLOGIQUE DE VILLEFRANCHE SUR MER.